NOC2K is a next generation of tiny oscilloscope base on the 32-bits microcontroller LPC2144 NXP company. Its main feature is small size 50x70xx25 mm and simple construction. In this solution utilize internal two analog to digital converter working at maximum sampling speed of 1MHz. Moreover microcontroller is equipped in internal RAM memory 16KB which allowed to buffer samples before sending them to PC. Adopting LPC2144 with two independent converted allowed to obtain good separation between two channels and also give it ability to use it in qudrature sampling. 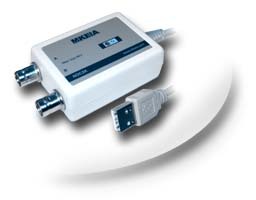 Inbuilt internal USB interface simplified communication with PC and do not required additional components. In order to adjust offset level is performed internal PWM generator which output is externally filtered and unity amplified (LM358). Analog inputs are classical differential circuit built on precise amplifier AD8602. Adjustment of sensitivity is made by popular analog switches 74HC4066. Working mode is changed by bistable rely. Software for NOC2K is compose from two application. First one xOC2K is software for oscilloscope and second is rOC4K for sampling recorder. Not only xOC2K application enables almost all function which provide analog oscilloscope, but also many others. For instance: FFT analysis, FIR filtering, trace mode A,B, mathematic function (sum course, multiply course, inverse etc. ), cursors, measurements, print, load and save. rOC4K software allows to record long courses (limit by size of hard disk) at 10kHz maximum sampling. Additionally, recorder can calculate FFT on arbitrarily long date, but the window of data is limited to 65536 samples and result is the average of this windows. Developed oscilloscope is destined to amateurs electronic, services, schools and universities, telecommunication companies and automotive. NOC2K is a perfect tool for audio devices and microprocessor systems.